So let’s say you’re in in trade talks with a leaguemate. He offers you Mets starter Noah Syndergaard in a package for some of your prime assets. Would you buy a used ballplayer from that man? Your inclination is to say yes. Syndergaard is clearly a fantasy stud. He’s the seventh-highest value among NL starters on BaseballHQ.com’s valuations, seventh in strikeouts, with an ERA of 2.49 and a WHIP of 1.06. Plus he has the cool nickname. And at 23 years old, he has a seemingly bright future—so he’s especially attractive in keeper and dynasty leagues. Or is he? I don’t know any more than you do on what Syndergaard’s future holds, but I can tell you this: If I were on the receiving end of a Syndergaard offer, I wouldn’t give up a heavy package in return. And if I were a Syndergaard owner, I would be seriously considering selling while I can. The issue, of course, is Syndegaard’s now cloudy injury risk profile. Syndergaard opened the year with four straight PQS-DOM starts (4-4-5-4, a 4.25 PQS average) and a brilliant 1.69 ERA/0.97 WHIP and 12.8 K/9. He was battling with Clayton Kershaw (1.50/0.77-4.25 PQS) for the title of best pitcher in the league. Since that awesome opening skein, though, Syndergaard has sunk steadily. He has only four more PQS-DOM starts (Kershaw has nine), and his PQS average is down to 3.5. His 2.95/1.11 line and 10.4 K/9 are still good numbers, but no longer great, and trending the wrong way. The team sent Syndergaard for an MRI, which showed “no structural damage.” He was prescribed anti-inflammatory medication. Notice that term “flared up,” again. And if you hear those brakes squealing a little, nothing to worry about. Cash? Or check? True to his self-assessment, Syndergaard went back to the mound, on his regular five-day schedule. He lasted just three innings and surrendered seven hits, three walks, and five runs to the struggling Nats. After the game, Mets beat writers started reporting that Syndergaard was dealing with bone spurs in his right elbow. Medically speaking, bone spurs, as we’ll see in a minute, are calcifications that develop because two bones are banging and rubbing together. That might not be a “structural problem” per se. Just like it is not a “structural problem” if you see metal shavings under a brake rotor, because at that moment the brake will help stop the car. Not a structural problem, but still a problem, because it is a strong indication that something in the mechanism is not working properly. A review of medical and orthopedic websites strongly suggests connections between elbow bone spurs, which are already problematic, and ligament issues that could be much worse. In honor of the late, great Gordie Howe, let’s stick a little elbow in here. In the joint, the bone of the upper arm, the humerus, cups into the olecranon like a bat balanced in the palm of your hand. The olecranon is at the top end of the ulna, the big bone of the forearm on the pinky-finger side (the other forearm bone, on the thumb side, is the radius). I’m also pretty sure that de arm bone connected to de neck bone, but don’t quote me. The elbow would be a terribly weak and unstable joint if it weren’t for three ligaments holding all the parts of the joint tightly together, like duct-taping that balanced bat onto your hand. But the ability of those ligaments to maintain the stability of the joint assume normal use. Intense overhand throwing, like 95-mph sliders, is not normal use. It puts the elbow ligaments under tremendous strain. The ligaments are as tough as the steak in a roadside diner, so they don’t tear easily, but they do stretch, and when they do, the joint gets loose. And as moms told their daughters back in the ’50s, a loose joint can get you into trouble. In an article titled “Elbow Injuries in the Throwing Athlete,” the American Academy of Orthopaedic Surgeons (AAOS) describes what happens once the ligaments stretch: “The olecranon and humerus bones are twisted and forced against each other.” Think of the olecranon as a mortar, the humerus as the pestle, and the elbow cartilage as the hemp seed you're crushing to make your horrendous morning smoothie. As a result of the grinding, “the protective cartilage on the olecranon is worn away and abnormal overgrowth of bone—called bone spurs or osteophytes—develops.” And they can really hurt, even if the person with them refuses to admit it. Furthermore, while the spurs do not usually cause ligament damage directly (see below), they are an indication that mechanical issues and genetic predisposition have caused the ligaments to become stretched, which increases the risk of a tear to the ulnar collateral ligament (UCL)—the ligament replaced in Tommy John surgery (TJS). Orthopedic surgeon Dr. David Lintner wrote in an article at throwing injuries.com: “(I)f a pitcher has bone spurs in the elbow, the UCL must be evaluated. If the problem is stemming from the UCL, it must be reconstructed and the spurs removed... . (I)f a pitcher has bone spurs in the elbow this is sometimes a warning sign that problems with the UCL may be coming” (emphasis added). With this sobering warning ringing in our ears, let’s review Syndergaard’s past elbow and forearm problems. In 2014, in Triple-A, he was diagnosed with a flexor pronator strain in his right forearm and spent time on the DL. These flexor strains often precede the elbow injuries that lead to Tommy John surgery. In 2015, Syndergaard again had problems with what was called “forearm tightness” in spring training, and missed his first four Triple-A starts. 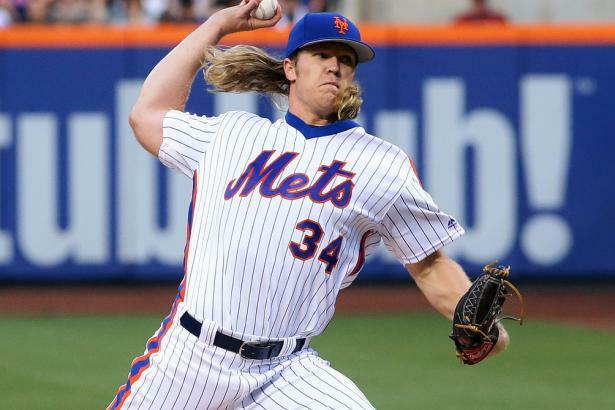 That May, after a five-inning, four-run start, doctors again examined Syndergaard’s pitching elbow, including an MRI, which showed no ligament damage. Then this year, and more bad elbow news. Flexor strain. Forearm tightness. Bone spurs. Taken separately, each of these is a red flag indicating the possibility of future ligament issues. Taken together... it might not mean anything, but if you're in a Syndergaard deal, it’s something you have to include in your calculations. First, “taller and heavier pitchers.” At 6-6, 240, Syndergaard is listed among the tallest and heaviest pitchers in the majors. Second, “pitchers who throw with higher velocity” (emphasis added). Syndergaard is also one of the hardest throwers in the game. And third, “pitchers who throw with arm pain or while fatigued have the highest rate of injury.” It appears Syndergaard is apparently already doing just this, being a good soldier, downplaying his elbow pain and making all his starts. Beyond those, Syndergaard has been a heavy sinker-slider pitcher, two pitches (along with a cutter) that have been implicated in increased risk of elbow injury. Every roster decision in fantasy baseball is a balance of risk and reward. That includes what to do in managing Syndergaard’s obvious injury risk. Essentially, you have to lay out the likelihoods of various outcomes and price them into the results you would get from a Syndergaard deal. In the short run, Syndergaard may be okay managing the elbow soreness with anti-inflammatory medication, physio and rest. He might not have any unusual soreness or other difficulties, and he might pitch well through the rest of this season (or the rest of his career, for that matter). For this season, he would be a pitcher with fantasy value in the mid-$20s, with upside of $30 or more if he can return to his early-season form and keep getting wins (a whole other area of pitcher risk). If Syndergaard's soreness gets any worse, though, the options range from awful to hemp-seed-smoothie horrible for fantasy owners. The Mets could try to forestall surgery by limiting Syndergaard's innings and/or pitch counts, especially if the team moves into a position comfortably into or out of the playoffs. Shorter outings, skipped starts—they all add up to less fantasy production. Worse, the bone spur could continue to grow, causing more pain until Syndergaard has to deal with it surgically. The typical surgery is arthroscopic, but even that would cost him time away from the mound if it were performed in-season. When Yankees starter Masahiro Tanaka had arthroscopic surgery to remove a bone spur from his elbow, his recovery started with six weeks of exercise and strengthening, followed by a throwing program. Say seven weeks total. That was off-season, but in-season, Syndergaard would miss nine or 10 starts, with a corresponding giant reduction in fantasy value. From a keeper perspective, the risks are even greater. A huge part of Syndergaard’s fantasy value is based on his youth and the prospect of having an ace pitcher for two years, three years, or for the rest of his career. But in a standard keeper, if you get him this year in Year One of a standard Roto contract, you get two more cheap years. Depending on timing, a TJ surgery would basically cost those two years and devalue Syndergaard to zero. It is a lot of risk. But that doesn’t mean it’s a deal you can’t make. If you’re, say, fourth in your league and need a big push in your pitching category, and it costs you some prospects, maybe it’s a good idea. If you’re leading the league, or if the price includes a good-value steady contributor, maybe not. Just make sure you listen carefully and pay attention to that grinding noise in the wheel bearings.